The site has developed steadily since opening in 1977 It has an Outdoor Swimming Pool, Public Bar and Restaurant, 2 Toilet/ Shower blocks, 2 Wash-up area's, Laundry room and a small children's Play Area. The site is level with good access from a private road. Pitches are divided into small groups, with no over crowding. We like to operate the site in a friendly informal manner, with a minimum of rules and regulations. 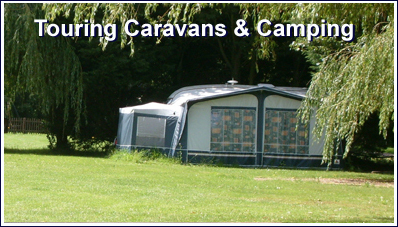 Prices are per night per unit, with awnings, cars, visitors, dogs etc. Please note that the unit price only covers < the number stated above, any additional people 5yrs old and above will be charged an extra £2.50 per person per night. Electric hook-up pitches increase by £4 per night per pitch.